When my former Zimbra co-founders told me they were ready to start another company, I knew I had to work with them again. This is a team who knows how to build successful companies. Their pitch of using AI to kill information overload while connecting the dots inside the enterprise sealed the deal. I’ve spent a ton of time over the years thinking about this market and the opportunities for disruption. 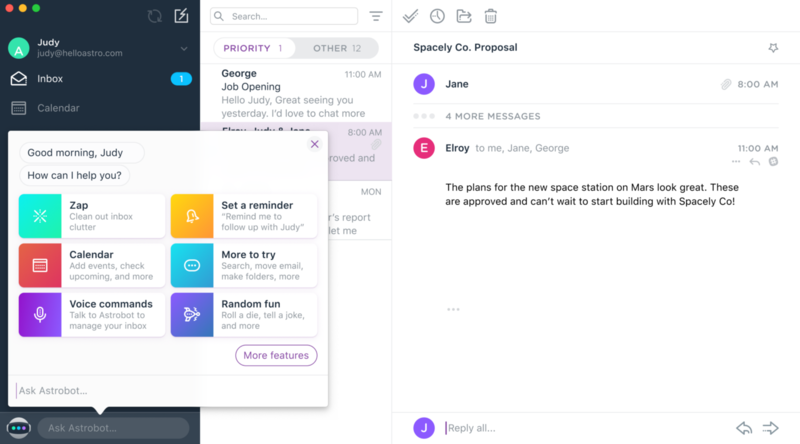 Astro uses natural language processing and machine learning to access the back office of businesses coupled with a great UI (be it chat or voice), all of which makes the enterprise immensely more productive. And what better place to start with than email as it offers an enormous source of data (essential to any ML platform) to discern the real social graphs of professionals, understand the relative importance of specific relationships and ultimately provide a smart platform that helps connect people in their work lives in better and more interesting ways. The launch of Astro’s first beta product is the first step to realizing their broader vision. I have been using Astro the last 6 months and it has made me immensely more productive. I’m excited to see where they take this product and company but most importantly, I am excited to work with this team whom I respect and enjoy. Sign up for the public beta here and see how it helps you become more productive. Originally published at www.redpoint.com on March 9, 2017.